One out of three children in U.S. are now considered overweight. The tradition of sitting down to dinner as a family has slowly been replaced by take-out pizza eaten while viewing the newest episode of American Idol. But where do parents find the time to teach their children the importance of healthy eating? As America’s Nutrition Expert® and mother of two young girls, it’s been my personal experience that when it comes to teaching your kids to eat healthy, you can never have too many cooks in the kitchen. 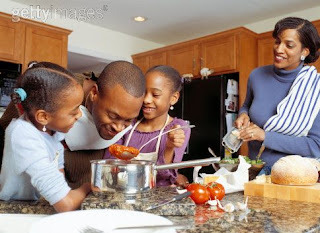 Here are 4 tips to get your family cooking together. Kids are bombarded today with advertisements for sugar-laden cereals, soft drinks and fast food, it’s our job as parents to encourage kids to eat wholesome and healthy foods. But how can we make meals fun and kid-friendly? Try creating healthier versions of foods that inspire the kid in all of us such as fruity milkshakes, sweet potato french fries, and Shrek-inspired green veggie dishes. One easy way to include your children in the process is to make them part of the preparation. Ask for meal suggestions, and draw up a shopping list together. At the supermarket, have your kids pick out fresh produce and other healthy ingredients, encouraging them to try one new fruit or vegetable they haven’t tried before. When kids pick out the foods themselves, they’ll be even more excited to try out new recipes, and you’ll feel great knowing that they are eating nutritious foods. Spark up a conversation over dinner about the interesting blend of tastes and flavors, and have the kids offer suggestions on possible variations of the recipe for next time you prepare the meal! The kitchen can be a wonderful learning environment for children. As your kids measure or weigh ingredients, they are reinforcing important math skills. Artistic expression flows as kids are allowed to decorate their own creations, or arrange the food attractively on the plate. Reading recipes, following directions, and practicing good table manners are all important skills to be encouraged. Want to brush up on geography? Have your family choose a country, pinpoint it on a map, then prepare an interesting meal that a typical family in that country would eat. Of course, choose healthier versions of those recipes whenever possible. Spending quality time with your family that doesn’t revolve around the television, laptop, or Blackberry can be delicious. When preparing food becomes a family affair, everyone wins. You’re actively involved with your children, working together to create healthy and delicious meals that everyone can enjoy, and which promote healthy habits that will last a lifetime. In fact, try one of my favorites that encourages great conversations at the dinner table. My girls love it! Bon appétit to you all! Preheat oven to 400F degrees. Spray tortillas with olive oil cooking spray. Spread tomato sauce, leaving room for the crust. Each family member chooses their own desired toppings. Place directly in oven for a crispier crust and bake for 15-20 minutes. Allow to cool, slice and enjoy! Preheat oven to 350F degrees. Slice up the zucchini and carrots into circular shapes. Defrost frozen spinach and place on bottom of casserole dish. On top of spinach, alternately layer carrots, okra, and zucchini. Sprinkle lightly with parmesan cheese. Cook for 20-30 minutes. Allow to cool, then cut into squares (place toothpick to keep veggies stacked). Drizzle warmed pesto over veggie towers. Put ingredients in blender, and whip until desired consistency. Top with fresh blueberries. I'm really impressed with this informative article. Encourage physical activities that children really enjoy. Remember that each child is unique and may have to experiment with many activities until he or she finds one that is enjoyable. Healthy habits is essential for prevent childhood obesity. You should definitely prevent childhood obesity. Teach your kids the right nutrition to maintain their health.